From expanding into new territory, shoring up your brick-and-mortar location, to paying off high-interest debts that just won’t go away, there might be many reasons you’d need a small business loan. The Small Business Administration routinely lends $50 million or more each year, and you can take advantage of both the low interest rates and favorable terms of these loans as compared to traditional loans. In 1953, President Eisenhower signed the Small Business Act into law. Since then, it has supported small businesses in need of working capital to get started or maintain operations. According to the text of the original bill, the SBA’s function was to “… aid, counsel, assist, and protect, insofar as is possible, the interests of small business concerns.” Despite many attempts by Republican presidential administrations to defund or even abolish the SBA, it remains a stalwart part of the world of small business loans. How Does the SBA Lend Money? The SBA partners with banks, credit unions, and other lenders in the areas where it lends money. Typically, the SBA gives the money to the lender to lend to the business in what’s known as a 7A loan. In this case, the SBA guarantees a portion of the loan so that the lender can be sure of getting at least some of the money back, should the business fail. For loans above $150,000, there is a guarantee fee that the business pays to the lender to offset the costs the lender has paying the same fee to the SBA. The fee is usually roughly 3 percent of the total amount borrowed that is more than $150,000. As an example, let’s say XYZ Corporation borrows $200,000. The SBA might guarantee 75 percent of that amount, or $150,000. The guarantee fee would be 3 percent of $150,000, or $4,500. How is the Interest Rate Figured? In the current lending market, variable-rate loans are very popular because both the prime rate and LIBOR are quite low. Conversely, within the last 10 years, the prime rate has approached 9 percent, which made fixed rate loans taken out 15 years ago wise decisions. Borrowers should, therefore, speak to their lenders to find out all the ins and outs of both kinds of loans and get the best possible recommendation regarding them. The rate, after all, won’t be as low as it is forever. Other Than 7A, are There Any Other Kinds of SBA Loans? In a word, yes. There are what are known as CDC/504 loans. Generally, these loans have a much lower interest rate than their 7A counterparts. The chief difference, other than the lower rate, between the two loan types is that a CDC/504 loan is specifically for the purchase of real estate. Even though 7A borrowers can also buy real estate, the lower interest rate available through a CDC/504 loan is geared toward the much longer terms associated with mortgages and other property liens. CDC/504 loans have such a low interest rate because only about 50 percent of the lent money comes from either the SBA or a financial institution. The rest comes from a not-for-profit agency called a Certified Development Company. Typically, the borrower must put down 10 percent of the borrowed amount to receive a CDC/504 loan. Additionally, because the vast majority of these loans involve real estate, there is automatically collateral available in the unlikely event that the borrower cannot pay back the loan. CDC/504 loans are also required to be fixed-rate loans. 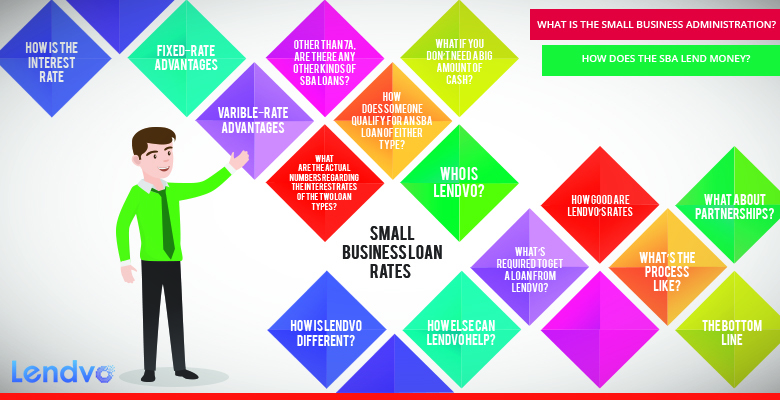 What are the Actual Numbers Regarding the Interest Rates of the Two Loan Types? In July of 2016, the maximum interest rate for 7A loans ranges between 5.75 percent and 8.25 percent. The range for CDC/504 loans is from 3.04 percent to 3.56 percent, and that includes the fees. These numbers are consistent with loans made by traditional commercial lenders. Most of those lenders, however, don’t want to lend less than $300,000 at all, and they generally balk at lending less than $1 million in any event. In many cases, commercial lenders won’t lend at all unless they are also SBA partners because the risk is too high. How Does Someone Qualify for an SBA Loan of Either Type? The business must have existed for two years. The borrower’s personal credit score must be 660 or higher. The borrower must ask for at least $30,000. The business must have had $50,000 or greater in income over the preceding 12 months. The borrower also cannot be in either the insurance business or the world of finance. The borrower’s business must also be for profit. Also, any small businesses that are owned by larger conglomerates are disqualified. Any business asking for an SBA loan also cannot sell items or participate in activities that might be legal somewhere but illegal elsewhere, such as pyramid-style businesses or gambling enterprises. If a business is owned by more than one person or entity, each person or entity who owns at least 20 percent of the business must also meet certain requirements, such as passing a financial history examination. For example, let’s say Sam owned a business 10 years ago and got an SBA loan. Further, let’s say Sam lost his shirt in the 2008 meltdown. In 2016, let’s say Sam goes into partnership with Susie in a new enterprise. If Sam owns 20 percent or more of Susiesamcorp, it’s likely that the business will not be able to secure an SBA loan because Sam failed in business as part of an SBA loan in the past. In addition to all of a business’s tax forms, all owners must also submit lists of their assets and liabilities as part of the application process. Each person with a 20-percent stake or more, along with any guarantors who are not part of the borrower’s company itself, must also submit an SBA Form 413. It’s possible to secure a loan of up to $5 million, so the government vets all prospective borrowers thoroughly. What if You Don’t Need a Big Amount of Cash? Borrowers who are seeking small loans of $35,000 or less can use the 7M Microloan program. Unlike 7A and CDC/504 loans, which come from lender partners of the SBA, 7M loans are paid directly from the SBA to the borrower. These loans require borrowers to attend classes in starting a business, which although free, might be superfluous when it comes to experienced entrepreneurs. The usual amount lent is roughly $10,000, which is normally “seed money.” Alternatively, you could check out a nontraditional commercial lender like Lendvo. Lendvo specializes in lending to digital businesses. Generally, these businesses have little to no overhead because they don’t have physical locations or scores of employees who must be paid. Often, they only need a few thousand dollars to accomplish their goals. Lendvo, however, can accommodate businesses that need up to $100,000. Lendvo also uses a set of algorithms that can assign value to a website and bases many of its lending decisions on that. It only makes sense because digital businesses normally don’t have physical locations that can be used as collateral. Lendvo also considers many other pieces of information when making lending decisions. Even though your credit score and credit history come into play, those two numbers aren’t the only things considered. Lendvo considers things like the value of intellectual property and click-thrus. Lendvo also looks at online traffic statistics for all of a borrower’s webpages and customer reviews and testimonials about a company’s products and services. Many eBay sellers and sellers who consign their products through Amazon would benefit from Lendvo’s services. Lendvo isn’t a bank and isn’t beholden to some of the draconian laws under which banks must lend money. Because Lendvo is not a bank and has its own proprietary set of evaluation algorithms, it can approve loans and disperse funds in as little as 12 hours. Of course, not every business will receive a turnaround time that’s that quick, but most businesses will receive their funds within 36 hours. That’s a far cry from what is sometimes multiple months with traditional loans even including SBA loans. How Else Can Lendvo Help? Borrowers with existing high-rate debt can refinance that debt through a loan from Lendvo. Borrowers can also choose to repay the loan by the day, week, or month, providing unparalleled flexibility in the lending marketplace. Lendvo also lends money to businesses looking to buy other online businesses or secure unclaimed domain names. Building on the flexibility it offers, Lendvo also customizes loan terms based on a business’s unique needs. In some cases, Lendvo can even perform the screening process on the phone without the mountains of paperwork required by traditional lenders. What’s Required to Get a Loan from Lendvo? Chiefly, Lendvo needs three complete months of your business’s bank statements, access to your website or websties, and in some cases, web monetization data and/or historical bank statements. Lendvo will consider all aspects of your business and make an offer. Of course, not every loan will qualify for every available rate. At Lendvo, interest rates start at only 1.5 percent monthly for loans based on working capital, which is the amount left over after subtracting a company’s current debts from its current assets. For loans that finance the acquisition of domain names, Lendvo’s rates range from 1-3 percent. You contact Lendvo and submit an application where you list all of your assets, including digital assets, and have a phone conversation with the lending manager. You choose the amount of the loan you want, the repayment terms, and any other special considerations. The loan officer will then call you back and present you with an offer. Should you accept the offer, you’ll receive your funding within another 36 hours. Lendvo strives to make the process as hassle-free and streamlined as possible. Lendvo partners with other businesses and lends their customers money too. Independent sales organizations, or ISOs, for example, have many business clients who need financing. Lendvo works with these ISOs to help them get the funding they need. Lendvo even works with banks that don’t understand the digital world and helps them by underwriting part, if not all, of some of their loans. No matter which kind of small business loan is right for your business, you would be wise to speak with a professional about all of your options. Of course, if you require more than $100,000, you won’t be able to take advantage of Lendvo’s services, but the SBA is there to help. There are many things to consider, such as the prime interest rate, the LIBOR, any changes in lending law, any changes to the SBA itself, or changes in the tax code, just to name a few.